10 Pages: Homepage, contact page with form, about, site map, links, testimonials, products page with optional Paypal cart page, missing and two thanks pages. Features: Contact form, products or Paypal cart page, graphic logo option, Google AdSense ready, see AdSense sample. iPad, iPhone, tablet, netbook, smartphone, mobile and also PC and Mac desktop and laptop optimized. Details: HTML5 / CSS, JPG images with meta tags setup for optimal viewing on tablets, smartphones and mobile devices. See details. Human and inspirational stock photos. For all tablets, pads, smartphones and all PC and Macs! HTML5 optimized for tablets, iPad, iPhone and smartphone viewing. Allwebco tablet website templates can be used for any business or personal website project to sell apps or other items. Basic HTML, plain text menu, standard .jpg images. Edit using any HTML or text editor. Notepad, TextEdit, Exp Web, FP, DW, more. Compatible with any web host company. Details: HTML5 / CSS, JPG images with meta tags setup for optimal viewing on tablets, smartphones and mobile devices. See details. Business and city stock photos. Details: HTML5 / CSS, JPG images with meta tags setup for optimal viewing on tablets, smartphones and mobile devices. See details. Colorado and southwestern stock photos. Details: HTML5 / CSS, JPG images with meta tags setup for optimal viewing on tablets, smartphones and mobile devices. See details. California stock photos. Details: HTML5 / CSS, JPG images with meta tags setup for optimal viewing on tablets, smartphones and mobile devices. See details. Feminine and human stock photos. Optimized for best viewing on iPad, tablets, iPhone, smartphones, laptops, PC Windows and Mac! Developed using HTML5 / CSS with standard .jpg images, Allwebco Design iPad light web templates are complete website setup with multiple formatted webpages and built-in scripts. Homepage, contact form page, about, links, testmonials, an optional Paypal shopping cart page and more are included. Developed specifically for the highest compatibility with mobile, smartphone optimization on PC Windows, Mac OS desktop computers, laptops, netbooks, pads, tablets, iPhone, iPod touch, Android, Droid Galaxy, Blackberry, Motorola Xoom, Galaxy Tab, Superpad, Thrive, HP Touchpad, Blackberry Playbook and more, plus built for ideal viewing on most mobile devices and smartphones. See also building a mobile optimized website. Tablet / iPad light web templates include a complete set of webpages with a global css style file and plain text headers, footers and menu. A contact page with an included form is built-in and all fields can be custom setup with new fields or existing fields can be modified. All included webpages can renamed and / or copied to allow for any size website project. Links in the menu are plain text and new buttons can be added to the global "menu.js" file using any plain text editor like Notepad or TextEdit. Designs are setup in HTML5 / CSS and are built Flash-free. Why Select an Allwebco Tablet Website Design? Our tablet site designs are the only complete websites offered. Other vendors include only a single page and in rare cases will include a 2nd page, unlike the tablet web templates offered by us that include a full set of multiple pre-formatted webpages. All designs include plain text menus so no graphics editing of any kind is required to develop a new, or update an existing, website. See HTML web templates for more details. All our sites are setup with meta tags and other code to allow for comprehensive website optimization using any tablet template design. Guaranteed for 30 days with a "no questions asked" money back return policy, tablet web templates can also be traded-in for up to 90 days and a new download can be requested for the life of any design free of charge. Included with all templates on this page is a Paypal shopping cart page that can be used to sell iPad apps or other items on-line. Options can be included with the Paypal order forms to allow a selection for sizes, colors or other options. A Paypal merchant account is free to setup and a percentage on each sale is charged through this payment gateway. 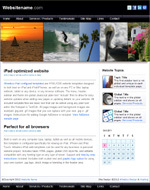 Every Tablet, iPad, iPhone, smartphone web template is developed in HTML using all standard .jpg image files. All pictures can be modified or replaced. No graphics editing is required for website setup or menu modifications. 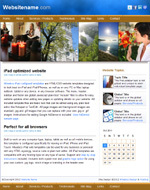 Tablet website template designs include no Flash animations for the highest cross-browser compatibility. Colors, fonts, basic layout heights and widths can all be modified in the global CSS style file. All source files and code used during development is included with every download as well as step by step instructions and unlimited searchable access to our comprehensive web template support site. Full email support is included. Any design can be used with any web host company or using an Allwebco hosting account. Built for ideal viewing in IE, Safari, Chrome, Firefox, Opera, Netscape and most mobile, smartphone and tablet computers. 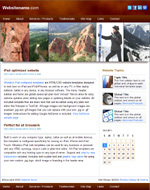 View web template features. Plain text for all files. Use any text or HTML editor. Css for all colors, fonts,layout. Inexpensive way to build a website. All setup is done by you to save money. 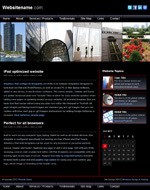 Available only on the Allwebco Design Corporation site, our tablet web templates are not available anywhere else.